There’s nothing like a Midas touch to take an outfit to the next level of glamorous, and this season, we’re going all-out gold. Nothing gaudy or showy—the latest pieces are more refined than flashy. Think ladylike silhouettes in luxe silk and decadant jacquard. 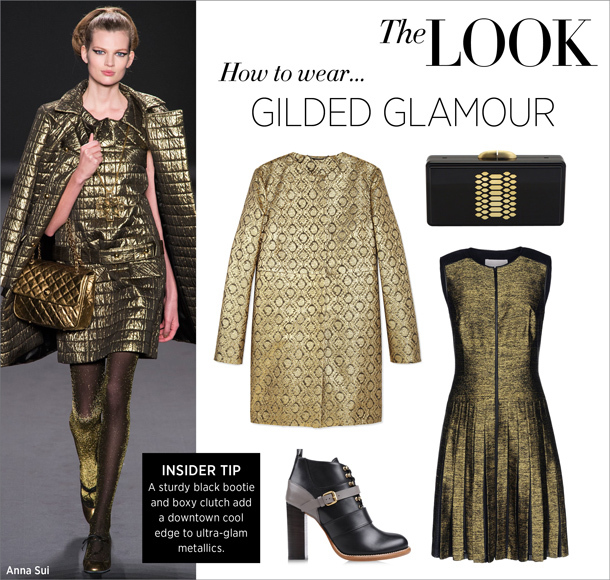 Try a shimmering brocade coat with a pleated dress in rich bronze tones for an opulent yet elegant ensemble. Just add chunky ankle boots and a structured clutch for a modern edge to your metallic look. SHOP THE STORY: Les Copains Gold Jacquard Coat, $1,095; Thale Blanc Ciara Clutch, $850; Jason Wu Silk and Leather Metallic Dress, $2,990; Chloé Lace-Front Ankle Boots, $1,275.